On Saturday, May 31, HBO will air a three-hour special of the 2014 Rock And Roll Hall Of Fame induction. The event itself — which took place April 10 in Brooklyn, New York — ran nearly two hours longer and featured the surviving members of NIRVANA playing a four-song set in which they were joined by female artists Joan Jett, Lorde, SONIC YOUTH's Kim Gordon and St. Vincent, each of whom took a turn singing in place of late frontman Kurt Cobain. Jett kicked things off by singing lead and playing guitar on "Smells Like Teen Spirit". She was followed by Gordon on "Aneurysm". Then came St. Vincent — real name Annie Clark — on "Lithium". Finally, Lorde joined the band for a rendition of "All Apologies". Several highlight clips from tonight's special can be seen below. R.E.M. 's Michael Stipe inducted NIRVANA at the ceremony. Accepting was bassist Krist Novoselic, drummer Dave Grohl and Cobain's widow, Courtney Love, along with his mother Wendy O'Connor and his sister Kim. Love's brief speech included her embracing Grohl and Novoselic, with whom she has feuded for years. Love said, "This is my family I'm looking at right now. I just wish Kurt could have been here. Tonight he would have really appreciated it." 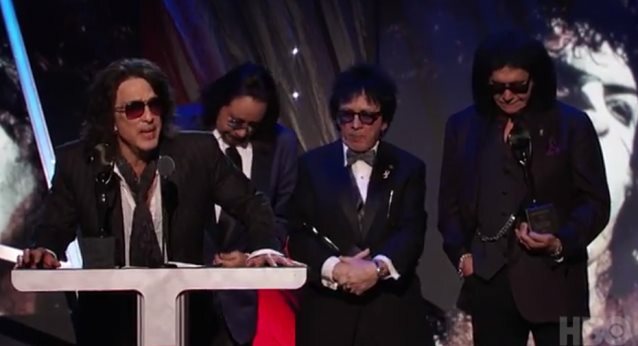 After weeks of bad-mouthing each other in the press, the four original members of KISS were inducted into the Hall by RAGE AGAINST THE MACHINE guitarist Tom Morello, with all four — Paul Stanley, Gene Simmons, Ace Frehley and Peter Criss — delivering warm, nostalgic and even sweet-natured speeches that put aside the simmering tensions for at least 12 minutes. Morello inducted the band by saying, "Tonight proves beyond a shadow of a doubt that the high school bullies and critics were wrong. KISS fans were right. Impact, influence and awesomeness — KISS have all three in spades… Tonight, this isn't the Rock And Roll Hall Of Fame. It's the Rock And Roll All Nite And Party Every Day Hall Of Fame." Gene Simmons spoke first, saying, "We are humbled — all of us — to stand up on this stage and do what we love doing. This is a profound moment for all of us." Simmons then spoke kindly about each of his original bandmates, while also mentioning former and current members as well as late drummer Eric Carr and late guitarist Mark St. John. Peter Criss said, "I'd like to thank the Hall Of Fame for this honor; I never thought this could happen in my life. Thank you." He also went through a list of people he wanted to thank, while also revealing that he has been free of male breast cancer for seven years. Criss concluded by saying, "I want to say that, even out of makeup, I'll always be the Catman. God bless each and every one of you — I will remember this the rest of my life. Thank you so much." Frehley joked that he couldn't read his speech because his sunglasses weren't prescription, then ran through his own list of thanks and revealed that he has been sober for seven and a half years. Like Peter Criss, he thanked the band's original manager, the late Bill Aucoin, as well as the late Neil Bogart, who signed them to Casablanca Records in 1973. Frehley ended by saying, "Only by the grace of God I'm here… Life's been good to me; hopefully I've got 10 or 20 more years to go." Paul Stanley ended the speeches by thanking Morello, "who's championed us shamelessly and unapologetically," and by calling the evening "vindication" for the fans. He also took a dig at the Hall Of Fame by saying, "The people, I believe, are speaking to the Rock And Roll Hall Of Fame, and what they're saying is, 'We want more.' They deserve more. They want to be a part of the induction. They want to be a part of the nomination. They don't want to be spoon-fed by a handful of people. Choices. The people pay for tickets. The people buy albums. The people who nominate do not. Let's not forget that these are the people that make it all possible. We just benefit from it." KISS did not perform — the Hall Of Fame wanted the original quartet only to play, while Simmons and Stanley insisted on the current lineup performing as well. In the end nobody won that battle. Backstage, Tom Morello was asked about what he made of KISS' inner-band issues going into the Rock Hall. "Well, the way I look at it is; every garage band and every stadium band has beef," he said, according to The Pulse Of Radio. "There's nothing special about that. Tonight is about what is special and that's the awesome band that KISS is and was, and the four original members and how they rocked my world, how they've rocked the planet since. So that other stuff doesn't matter to me." Although KISS came backstage for photo ops, Ace Frehley was the only member to come back and talk to the press. "Well, most of my influences are older than me," he said. "I'm one of the older inductees [laughs], y'know? I grew up with THE WHO, Jimi Hendrix, Jeff Beck, Eric Clapton, and LED ZEPPELIN. Y'know, those were the guys that influenced me. I influenced a lot of those guys that are getting inducted — guys like NIRVANA, PEARL JAM, and everybody else. But I'm so happy to be here, y'know, it's been 15 years (since the first) could've inducted us, y'know? But 15 years later they did. I'm just thrilled to be here and I'm in good company."